Outstanding African entrepreneurs running existing start-ups with high growth potential and aspiring business owners with transformative ideas are invited to apply. They are particularly looking to grow representation from French, Arabic and Portuguese speakers, as well as female entrepreneurs. 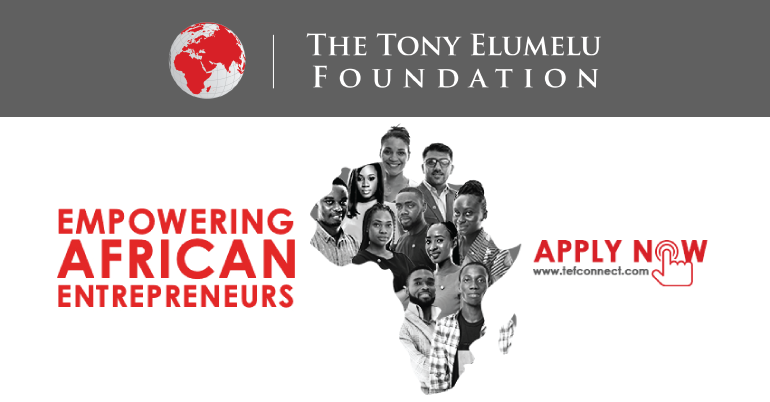 The organisation’s long-term investment in empowering African entrepreneurs is emblematic of Tony Elumelu’s philosophy of Africapitalism, which positions Africa’s private sector, and most importantly entrepreneurs, as the catalyst for the social and economic development of the continent. In 2015, TEF consolidated its various programmes and initiatives and made investing in Africa’s next generation of entrepreneurs and business leaders a priority. Please visit the official website to know about the funding system. Outstanding African entrepreneurs running existing start-ups with high growth potential and aspiring business owners with transformative ideas are invited to apply. Particularly looking to grow representation from French, Arabic and Portuguese speakers, as well as female entrepreneurs.